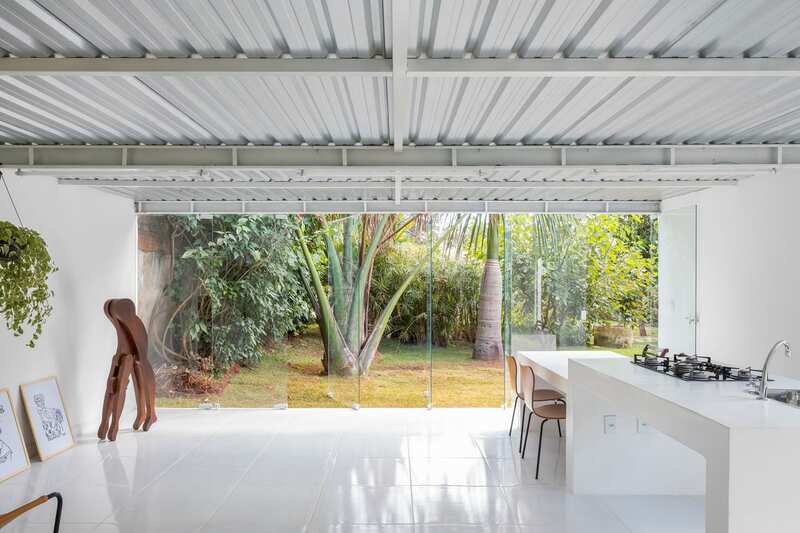 Compact, Budget Friendly Home in Brazil by Daher Jardim Arquitetura. 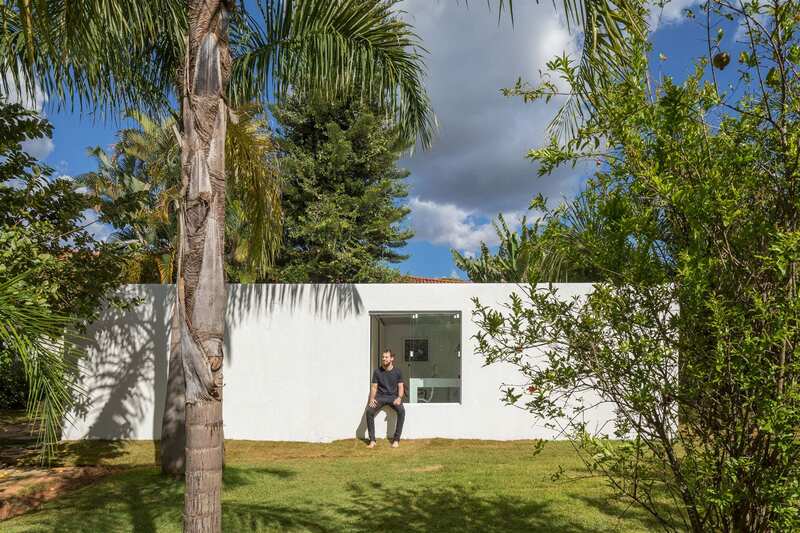 Daher Jardim Arquitetura completed ‘Little House’ in Brazil, extending a tiny 24sqm structure at the edge of a grassy site into a slightly bigger 60sqm house. The existing building was essentially just a bedroom and a bathroom, so the architects added a kitchen and living room; sometimes the bare necessities are all that’s needed. A restricted budget and tight completion deadline determined the materials and construction method, with the entire project completed in less than three months. 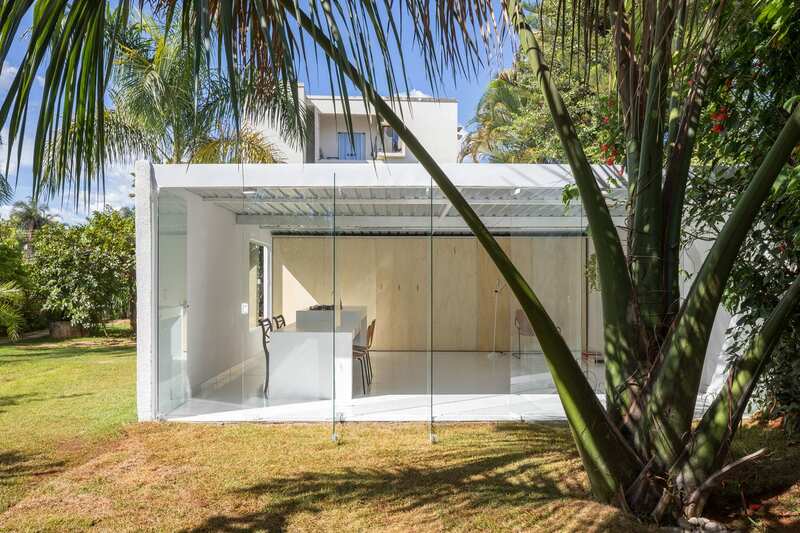 Both interior and exterior facades are bright white, helping to reflect the sun and protect from Brazil’s sometimes oppressive heat. 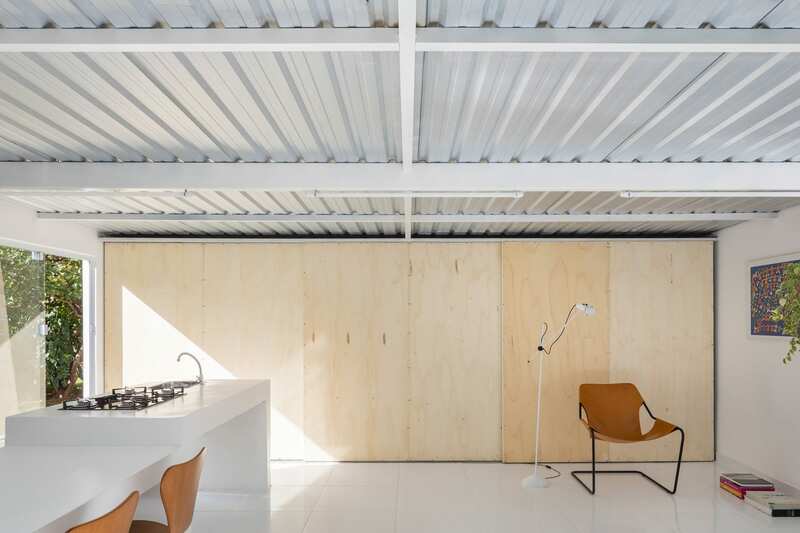 A sliding timber panel on a metal frame separates the bedroom from the kitchen and dining area. Thermoacoustic tiled floors were an economic, practical choice, aligning with the simple structure. 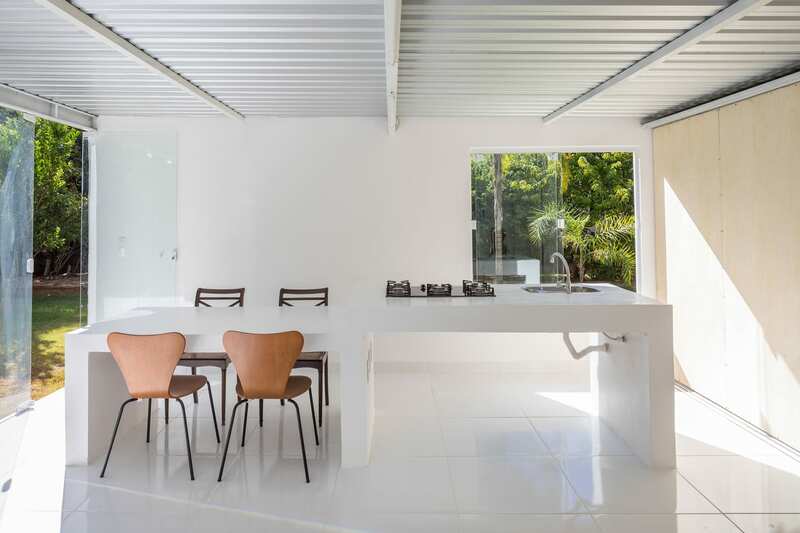 A moulded concrete bench doubles as a kitchen island and dining table. Artwork and indoor plants are essentially the only sources of colour or pattern, creating an overall fresh, clean aesthetic. 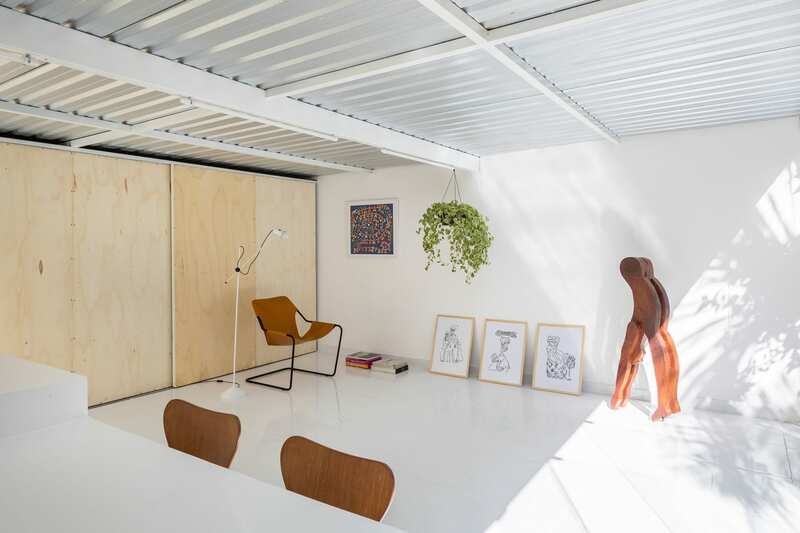 The corrugated iron roof and verdant surrounds give the feel of a garden shed – a bright, open, airy garden shed. The main living space is flush with the garden, and full height glass doors swing open to allow for ventilation and natural light. The home is a solitary retreat, with only one leather reading chair in lieu of a couch. A little more furniture might be necessary for entertaining. 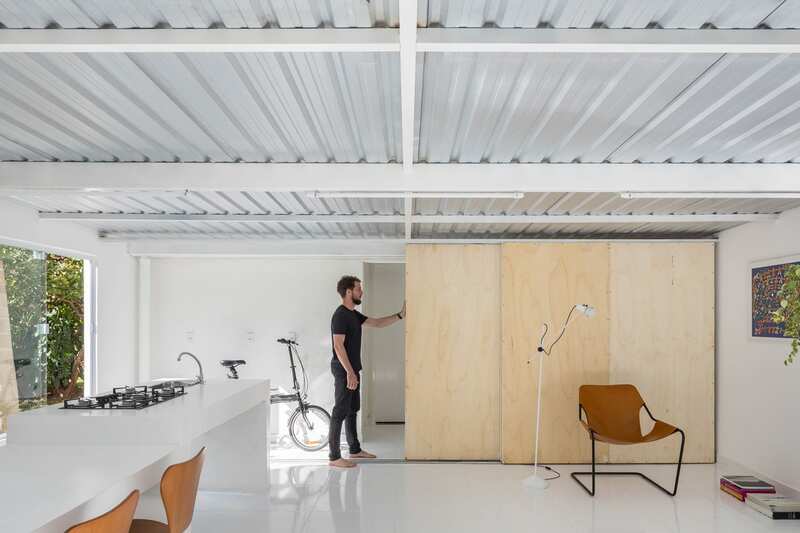 Little House is essentially a brilliant example of less expensive materials used well to create a space with design merit; even though details such as tapware are clearly not super high-end, the robust nature of the metal roof allows for lack of finesse. We just hope the said roof is well insulated! Related: So Hot Right Now // Living Large in Small Spaces. a complete hotbox with just tin no insulation under the roof. Interesting!